There is a quote that says, “When you stop living at work, you start working at living.” That sums up retirement perfectly. Retirement is the end of life as a professional but the start of life as an adventurer. But retirement is not the same for everyone though. Some may find it exciting, while some may find it alarming. But whatever your stance in retirement is, there is no denying the inevitable that it will arrive sooner or later. You may also see company email signature examples. Listed below are some examples of email signatures (PSD, AI) you can use when you will be creating your own retirement email signatures. Check them out now! Listed below are some tips in creating a retirement email signature. Take note that tips provided are not exclusively for retirement email signatures, but for other forms of email signatures as well. An email signature does not require multiple images and designs to be effective. In actuality, the less the design, the better. This is because the simple email signature does not rely on graphic design and visual aesthetics to be effective. Utilize a flat minimalist design (i.e., design that does not use any embellishment, such as shadows, bevels, gradients, or textures) so that the other details, specifically the personal details, will be emphasized. Despite using a minimalist design for the professional email signature, there are still hundreds of designs you can choose in which you can incorporate in your email signature. Among the designs, images, or stock photos, which can fit the concept of an email signature you can use, include eyeglasses, cars, motorcycles, coins, money bills, newspapers, road signs, grass, trees, calculators, etc. As previously mentioned, emphasis should be placed on the personal information and not on the design of the email signature. Even if you retired or nearing your way toward retirement, the details of the email signature are still important when you will be having formal email transactions and conversations. Personal information should include your full name, position or designation in the company (you can add the word retired before the position title if you are already retired), and contact number. The personal information can also be classified as business information as you are not really providing very personal details in the email signature. Make sure the text size is large enough to be readable not only by yourself but also by your colleagues or clients. You may also see business email signature examples. Since you cannot incorporate multiple images or designs in the email signature, insert quotes instead. Take note that the quotes don’t have to be about retirement, as they can be motivational or inspirational quotes. Insert the quotes at the bottom or at the background of the email signature. Life after Retirement: What Should You Do? You are reading this article not because you are just creating an email signature, but you are on your way toward retirement. So, after retiring from the job that has given you a source of income not just yourself but for your family, or retiring from the profession or career that has given you all countless success and life-changing failures, what’s next? Life after retirement can be both exciting and nerve-wracking. We have listed below some ideas and activities you can ponder on or get yourself involved with as you venture into this latest chapter in your life. There is always that saying that when you are a working adult, you have money and energy but not time, but when you are a retired citizen, you have money and time, but not energy. Although you don’t have to be 60 years old to retire, you have already spent a significant time of your life being employed or working hard to achieve success in your career. You may also see the dos and don’ts of a good email signature. Work always takes a heavy toll on an individual, not only physically but also mentally. Due to a busy work schedule, individuals don’t have enough quality time to spend with their families. There is no denying that after retirement, they want to gain back all that lost family time—time that was spent in the office and in other business activities. Quality time does not mean spending time with family and friends while spending for all their wants and needs. Quality time entails to reinforcing the once strong relationships through sharing personal experiences (mentoring), having meaningful conversations, and experiencing fun and fulfilling activities together with the people you love. You may also like sales email signature designs & examples. If you think that time is running out for you soon, spend as much time possible with people that matter to you the most. This probably listed as a top priority of individuals who are about to enter retirement. Visiting another country is not just for relaxation purposes, but an opportunity to experience a new culture, try unique and exotic dishes, and meet new people who have different perspectives in life. You may also check out teacher email signature designs & examples. Traveling to a new country is an experience like no other, and chances are you might even get permanent residency to that country you are traveling and live out the rest of your life there. According to studies, 8.7 million US citizens are living abroad with the Social Security Administration sending out around 500,000 payments per month to overseas residents. You might add to that growing number very soon. You might be interested in beauty parlor email signature designs & examples. If you plan on traveling the remaining 30–50 years of your life, you need to have a significant amount of retirement funds just to cover for your traveling expenses. You also have to consider the expenses of your companions if you are bringing a number of people for the trip. Take note of your age and physical condition when you are about to try a new hobby. You definitely don’t want to try your hand playing a new sport when you’re over 60 years old. You might spend all your retirement fund rehabilitating a broken back or spending for other bone-related injuries. You may also like music email signature designs & examples. If you think you can still endure rigorous physical activities like when you were in your early 20s, there are numerous physical hobbies you might consider. Some of these activities include hiking, scuba diving, rock climbing, sailing, cycling, outdoor photography, or team sports (i.e., basketball, soccer, volleyball, hockey, cricket, baseball). You may also check out wedding planner email signature examples. If the body is the weak but the mind is still strong, there are numerous hobbies you can try out not only to keep your mind sharp but to bring you entertainment as well. Some of these hobbies include playing an instrument, playing puzzle games, reading a book, cooking, dancing, writing short stories or poems, painting, learning a new language, and taking various online classes, to name few. You might be interested in marketing manager email signature designs & examples. There is a reason why pets (specifically dogs, cats, and fish) are being used for therapy in hospitals, nursing homes, and mental institutions. They are not only adorable companions, they also help lower stress levels and provide to be very useful in certain situations as long as they trained. Since you are now fully retired, you can spend most of your time taking care and having fun with your new non-human friend. But before you decide to adopt a pet, make sure to find an animal (or insect) that you can fully devote your time to and not just leave in a corner. Remember, pets also feel sorrow and pain if they are unaccounted for. 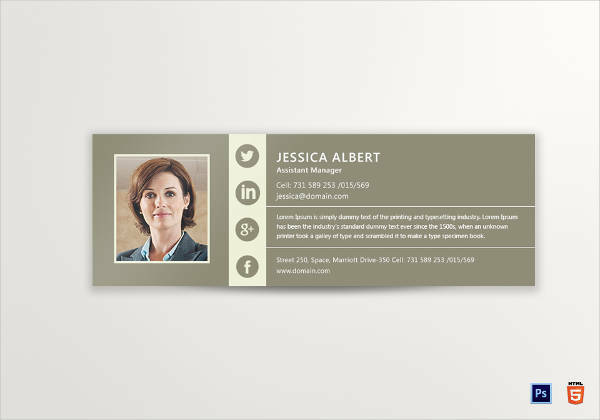 You may also see business manager email signature designs & examples. Depending on the breed, dogs and cats are the most ideal pets to bring home. But, if you are living alone, it is highly advisable to go for low-maintenance breeds. Take note that you still have to regularly groom them and clean their wastes to avoid having a nasty stench in your house. If you lean toward the more exotic and hair-raising type, you can always adopt reptiles such as turtles, snakes, lizards, and spiders, to name a few. You may also like hotel travel email signature designs & examples. Saving up for retirement is fine, but what if we told you that you can grow your cash through numerous investment options and get a larger amount from the initial funds you invested? No, this is not a scam. This is called exploring your financial opportunities. It is true that investment scams are rampant around the world. Even the biggest economy in the world, the United States of America, suffered a major financial crisis after a number of local banks were involved in high-profile investment frauds which resulted to millions of clients losing also millions of their investments. You may also check out Web developer email signature designs & examples. That is the reason why investing should not be a quick option for you after retirement. Investing requires extensive research. Saving is already a form of investment as you will be using the money afterward for numerous purposes. But there are other investment options you can go for depending on your risk levels. You might be interested in content writer email signature designs & examples. We hope you found this article to be informative as well as helpful when you will be creating your own retirement email signature. We have provided some examples that you can purchase at very affordable prices. Additionally, you can easily edit the examples to fit your own email signature. As previously mentioned, retirement is not the same for everyone. Some may find it exciting, while some may find it alarming. That is why we have come up with numerous options (and activities) on how you can enjoy as well as embrace life of being a retired citizen in the community. You may also see how to make a professional email signature.